......................... THE POWER 3 ....................... . Attention drummers - can any of you help? For an evening of the finest rock & metal. You know it makes sense!!! How Do You Get 5 Stars into 7 ??? The Stories to play Scotland ,our 1st venture north of the border . Live @ the Jolly Nailor on Saturday! Beer Festival Weekend! 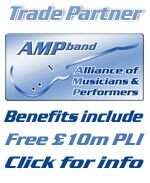 Southport alternative band require drummer!